It’s always good being told what you already know, and The Rough Guide to Bob Dylan does just that. It’s 380-odd pages manage to pack in enough biography, reviews, opinion, lists and trivia to keep any fan - or those just interested - happy. Author Nigel Williamson has tried to keep his distance and a cool head whilst reviewing Dylan’s whole output; and condenses the chaotic and confusing life of his Bobness into a fact-filled 190 pages. There are asides and mentions of intriguing bootleg material, a short section on the films, an exhaustive index, and a run through ’50 Great Dylan Songs’ along with a bunch of quotes collected as ‘The Wisdom of Bob’. These last two are probably the non-essential part of the book, but the rest of the stuff more than makes up for it. Concise, sensible and well put together. Meanwhile, in Studio A: The Bob Dylan Reader, which Norton are just about to publish, there’s Dylan seen through literature. 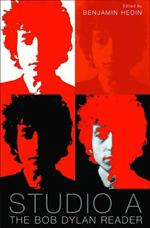 The book gathers up ‘articles, poems, essays, speeches, literary criticism, and interviews’, most of which were new to me, although some of the big name stuff by the likes of Greil Marcus is almost canonical as Dylan reviews go. Even so, there is plenty to entice and intrigue. The first section covers 1961-69 and includes a letter from Johnny Cash to Broadside, an excerpt from a Press Conference, and an early article discussing rock lyrics as poetry - although it’s author Robert Christgau has the decency to put ‘maybe’ in brackets at the end of his title! Greil Marcus’ infamous put-down review of Self Portrait opens Part Two, which also includes contributions by Ginsberg, Clive James and Rick Moody, as well as a fantastic freeform poem/rant by poet Anne Waldman. A real eye-opener for people like me who know only her more recent linguistically-innovative writing. Part Three opens with an intriguing interview about Dylan’s conversion to christianity, and moves through into the period when Dylan starts being perceived as an elder musical statesman. Here is his acceptance speech for the Rock and Roll Hall of Fame, here Cameron Crowe’s liner notes to Biograph, and an excerpt from Dylan’s piece in Songwriters on Songwriting. But there is also the lingering sense of disappointment with Dylan’s new releases here, as the titles of two other contributions, ‘Stillborn Again’ and ‘World Gone Wrong Again’, indicate. But the fourth and final part is more accepting, and includes writing about ‘Dylan at 60’, and some overviews of his work. What most intrigues me about Dylan is that so many people are intrigued by him; even people like myself, who don’t regard themselves as fans, want to know about him and his music, and own far too many albums by the man. Which is quite staggering when one realises [after consulting the Rough Guide] that he hasn’t released what I consider a good album for over 20 years! 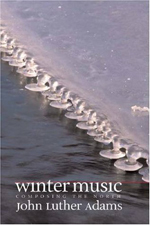 If Studio A is a book of writing about a musician, John Luther Adams’ Winter Music [published by Wesleyan University Press] is the opposite: a composer writing about his own music, and what shapes and informs it. I know Adams’ music through his releases on Cold Blue Music. He lives in the far north, and regularly travels to the Arctic, yet counters this with regular involvement with, visits to, and concert presentations in, the metropolises of America. So already there is a balancing act going on - the isolationist and explorer vs. the city-dwelling musician involved in the contemporary classical music scene. His music in many ways is also a balancing act ­ between busy minimalism, abstract sound sculpture, and silence itself. Adams is fascinated by ice, snow, blizzard, the empty - or seemingly empty - landscape, and what and who lives there. He draws on ethnic songs and stories, he observes and notes wildlife, he adores contemporary art and music. Many of these articles are as much travelogue, in the vein of Barry Lopez; as much art or music criticism as a composer’s essay. Throughout there is a lightness of tone, of touch, an attention to detail, all combined with a wit and storyteller’s art; much of the writing reminds me of John Cage’s, which is high praise indeed. What music I have heard by Adams’ - and there’s a 3 track CD included with the book - lives up to his notions and aims. Through the blizzard and white light, cold and alone, we hear the music dance; start to make sense of the strange world around us. Adams’ writing is clear and bright and lucid; it fascinates and illumines. This is the best music book I’ve read for a long time.